Hubbard: Will Troubled Tyson’s Fury Cost Him His Career? The future of Britain’s most colorful and controversial boxer Tyson Fury, the self-described Gypsy King, is in the balance after a hearing in London. Fury, who hopes to resume his boxing career if he can clear his name after testing positive for a banned steroid in 2015, attended the hearing at the UK Anti-Doping (UKAD) headquarters on Monday. He was found to have traces of nandrolone in his system, but claims it was the result of contaminated meat he consumed in large quantities. Last month, 28-year-old Fury, together with his cousin Hughie, 22, a fellow heavyweight who also tested positive, said they regularly devoured a whole boar between them each week, and strenuously denied using drugs to boost their performance. It is likely to be some time before the entire process runs its course and should he lose, Fury has 21 days to appeal. But the World Anti-Doping Agency (WADA) could also appeal against any decision, which could then lead to the Court of Arbitration for Sport (CAS) making a final ruling. 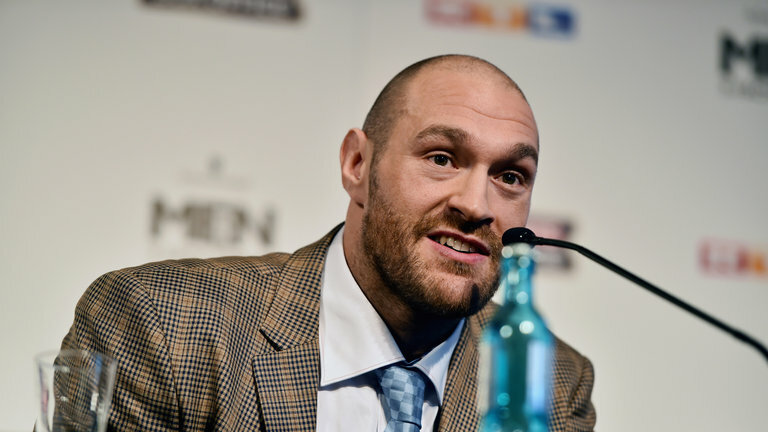 UKAD revealed that Tyson Fury had been charged “with the presence of a prohibited substance” in June 2016. Four months later, the British Boxing Board of Control suspended his license after it was known he had also endured problems with mental illness and cocaine since his astonishing win over Wladimir Klitschko in November 2015, when he became the world heavyweight champion. There are precedents for the Furys’ line of defense. Tong Wen, an Olympic gold medal-winning judoka from China, blamed pork chops when she tested positive for the steroid clenbuterol in 2009. She was cleared due to “procedural failure” in the laboratory tests. A year later, cyclist Alberto Contador cited a beef steak as the cause of clenbuterol traces being found in his system, but the Spaniard was banned by CAS in 2012. In December 2011, UKAD issued a warning advising athletes against eating liver due to the small risk of returning a positive clenbuterol sample if the meat was contaminated. As for nandrolone, it is related to the naturally occurring hormone, testosterone. It is possible to find traces of nandrolone in the body, but these are only ever at tiny amounts. Research carried out at Aberdeen University in 2000, which apparently showed a link between the steroid and exercise, has since been dismissed. The waters had been muddied by British bobsleigher Lenny Paul, who successfully argued in 1997 that he tested positive for nandrolone as a result of eating spaghetti bolognese made with contaminated beef, but scientists now agree that the steroid is not present in edible tissues. A similar defence was made when two swimmers claimed they had tested positive after eating a Brazilian dish of uncastrated boar’s meat. David Meca of Spain and Igor Majcen of Slovenia were banned for four years. While nandrolone, which is used in the treatment of breast cancer and for the rebuilding of muscle, has been around since the 1960s, it came to prominence in 1999, when 343 athletes tested positive for the drug. These included the high profile cases of Britain’s Linford Christie, Dougie Walker and Gary Cadogan. They were cleared of a doping offence by UK Athletics on the grounds that “it could not be proven beyond reasonable doubt that the substance present was derived from a prohibited substance”. The tests on the Furys were done around February 2015 when Hughie had just fought in Monte Carlo and Tyson was boxing in London. There were traces of nandrolone – just over what is permitted – found in one sample from each of them, but not in another. Prior to that, they had never failed any drugs tests. As it was, Tyson went on to beat Klitschko and Hughie was supposed to be fighting Joseph Parker for the WBO title last week, only for a back injury to rule him out. Tyson subsequently went off the rails, took to cocaine, failed a WADA test for that, and when UKAD went to test him, he angrily told them to “f*** off” and sent the testers away. Peter, his uncle and trainer and father of Hughie, rang them and apologized, tried to get them back, but they refused to return, which brought about the current suspension. Fury could face a two-year ban if found guilty of either offence, but his team are hopeful he won’t be – or at worst, any ban would be backdated to November 2015. He is keen to return to face fellow Briton and new IBF and WBA heavyweight champion Anthony Joshua in what would be fight worth more than $64.7 million. But first, he would have to get back his British Boxing Board of Control licence, which may not be easy. Fury claims that a date has been penciled in for a fight with Joshua at Wembley Stadium in April of next year, and that he hopes to return to the ring this July. “I could fight Joshua fight with one hand right now and beat him,” he boasts. “You see, I’m a boxer, a skilled boxer and muscle-beach men like him are made for me. It would be an easy fight. Two weeks ago, Manchester-based Fury, who has ballooned to 25 stones, relocated to the MTK gym in Marbella to begin losing some eight stones. His mental health has often been as troubling as his bulging waistline for some years now. He blames depression for his cocaine use. “If you think about it, I was the first high-profile sportsman to start taking about what was happening to me, my issues. I told the truth, never held anything back and that’s always been my problem: I tell the truth and people don’t like the truth,” he says. Whatever the truth about this curious saga, it is evident that troubled Tyson has a far bigger fight on his hands than he had against Klitschko or is likely to have against Joshua.